Welcome to the Express by Holiday Inn Stirling hotel. Guests at our hotel in Stirling can expect a warm Scottish welcome, comfortable accommodation and a great location for exploring Central Scotland, Edinburgh, Glasgow, the Trossachs National Park and Loch Lomond. Stirling itself is home to a fascinating history and the famous Stirling Castle. The great value rates at our Stirling hotel include free continental breakfast and accommodation in one of our modern, ensuite guestrooms. Our rooms can sleep up to 2 adults and 2 children, and feature high-speed Internet access, satellite TV with in-room movies, work desk with lamp, tea/coffee making facilities and hairdryer. We offer a range of room types to you’re your requirements including twins, family rooms and accessible guestrooms. Additional features of the Express by Holiday Inn hotel in Stirling include our fully licensed bar, professional meeting rooms and free parking. Furthermore, our guests can take advantage of the family restaurant and play area which is adjacent. 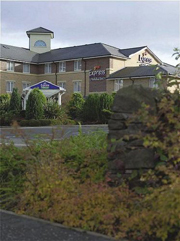 We trust that you will enjoy your stay at Express by Holiday Inn Stirling and if we can be of any help, please don’t hesitate to let us know.